October is National Pasta Month and that means that it is time for some pasta! Pasta Fits into a healthy diet, a busy lifestyle, and a tight budget; it is super versatile and always fun to work with! 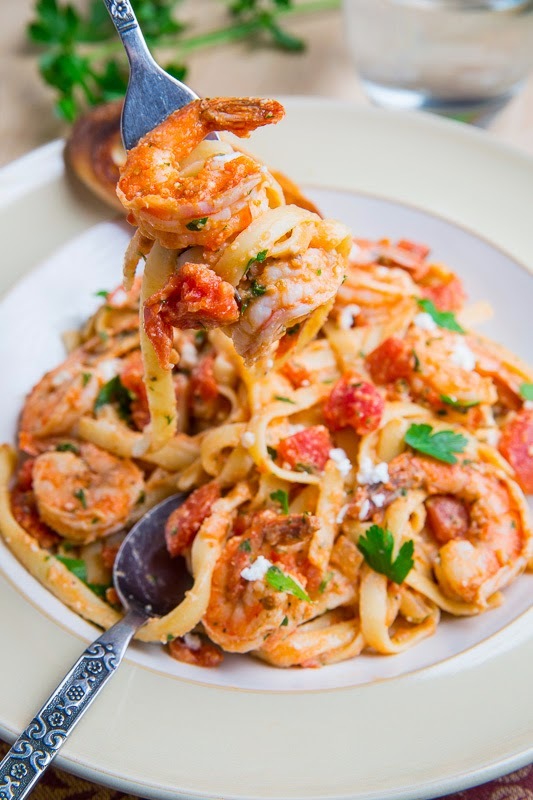 This shrimp linguine is inspired by one of my favourite Greek dishes, shrimp saganaki, where shrimp is cooked in tasty tomato and feta sauce and it works really well as a pasta dish! If you are looking for a quick and easy weeknight meal this recipe fits the bill literally only taking as long to make as it takes to boil the water and to cook the pasta. When in season, fresh tomatoes, dill and parsley really make this dish sing but otherwise pantry staples, canned diced tomatoes and dried herbs, also work well so you can enjoy this tasty pasta all year round. 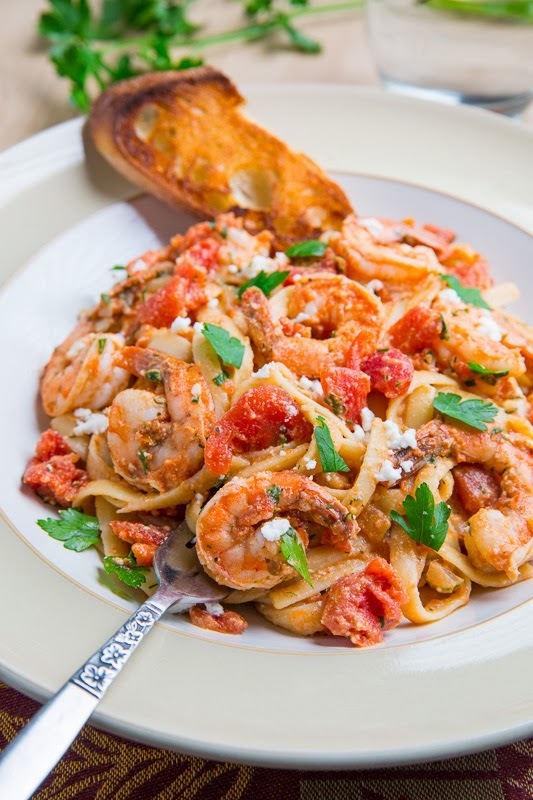 No matter how you cut it, this shrimp linguine in tomato and feta sauce, aka shrimp saganaki linguine, is a great way to celebrate National Pasta Month and it is sure to make a regular appearance in your meal rotation! Do you have a favourite pasta recipe? Share it with the National Pasta Association for the chance to win their Pasta Presto Recipe Contest with a $1500 prize! Disclaimer: This post and the Pasta Presto Recipe Contest were sponsored by the The National Pasta Association. All Opinions are my own. How didn't know that October was national pasta month?! I have some catching up to do. I think I should start with this one! How does this look so creamy without any cream?! So delicious-looking. Pinned! Looks SO delicious, can't wait to try it. Sounds like a dish my family will love. One pound of shrimp? Are we talking whole shrimp or just tails? There is absolutely NO comparison between a frozen, dehydrated shell off tail and a fresh whole shrimp. I spend a great deal of time in Asia and shrimp for the most part are prepared whole and fresh (just about every supermarket has at least two species and two sizes of each, some, 4 species and 4 to 6 sizes…my favourite is Tiger prawns, 26 to 30 count for my pasta dishes) In this dish if possible you could boil whole shrimp in very salt water for 3.5 to 4 minutes max or butterfly the tail and pan fry, either way the tast is 10,000% better than the cheap frozen white shrimp people would use in this dish and you can put the shrimp over the pasta and then the sauce over both. The tail shell can be removed very easily after cooking and if you try, you will not go back to the freezer! Equator: Living in Toronto it is almost impossible to get fresh shrimp or fish or any other seafood for that matter. Most of it has been frozen at some point for transit from the coast. I always go for the shrimp that are still in the shell and if I do not use the shells in the dish that I am making I save them in the freezer to use later in things like shrimp stock. I usually go for tiger shrimp at 20-25 count. What a gorgeous pasta dish! I've been craving shrimp this week too! Looks amazing! 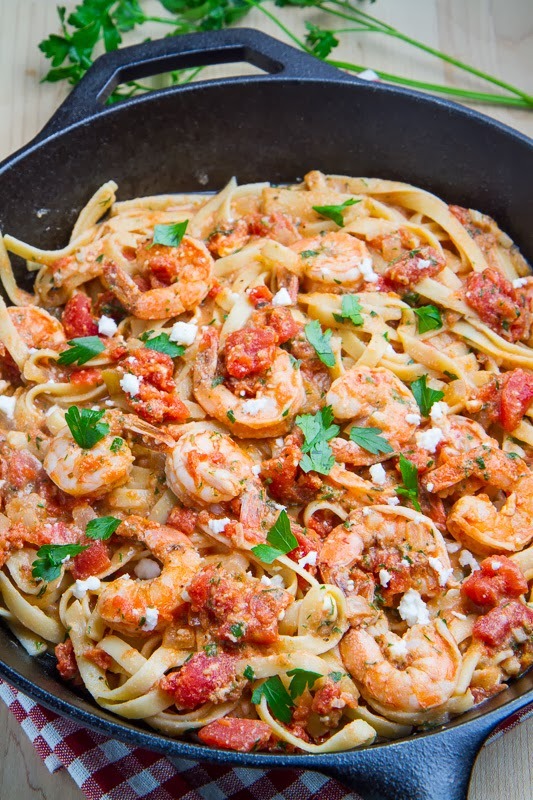 I have made your shrimp saganaki and it is one of our favorite dishes! this is just perfect! Thanks for another great recipe Kevin! Cheers from Montreal, Kevin! thanks for another excellent recipe – you are so consistently amazing! what can be used instead of feta? YUM YUM YUM! My husband and I made this tonight and it was awesome. All the flavors meld and blend so nicely together. We did use a pound and half of shrimp, used fresh dill but not fresh parsley. It's definitely one we will be making again. It's going into our book of tried and true favorites. Eight ounces of linguine wasn't enough though, probably would need more like 12 ounces because the ratio wasn't exact. We had enough for at least 4 more ounces of pasta left over and that's with plenty of this tasty goodness spread over our pasta. Maybe some of that was the extra shrimp? We served this with some steamed fresh asparagus lightly buttered. It's a relatively low fat and healthy dish. This would be a wonderful dish for having company over for dinner. But we're not waiting for company to come over before we make this again. LOVE IT! LOVE IT! LOVE IT! Anonymous: You could use cotija or queso fresco in place of feta. Although fairly different, you could also go for ricotta or even halloumi. Kevin I've made this twice so far for my family and it's a big big hit! I didn't change a thing except I added a little bit more shrimp. LOVE LOVE LOVE it! Family agrees this is now a FAVORITE dish which I will be making again and again. Thanks for posting it! Would it still be good if I used chicken instead of shrimp? I can't get a printable form for this recipe. Any suggestions? Anonymous: What browser and OS are you using when you try to print using the blue Print button? This looks so creamy and delicious!! I love all of your recipes!